A record crowd of nearly 500 attended the 20th ATHENA Awards luncheon Thursday at the Owensboro Convention Center. Cindy Fiorella, vice president of WorkForce Solutions at Owensboro Community & Technical College, earned the honor. She was one of 16 nominees — another record for the ATHENA Awards. Fiorella was unable to attend the ceremony, but Helen Mountjoy, the 2013 winner, accepted the award on Fiorella’s behalf. “This award could not go to anyone more deserving,” Mountjoy told the crowd. She noted that Thursday was International Women’s Day, which gave birth to the #PressforProgress social media campaign. #PressforProgress asks people to promote gender equality,celebrate women’s achievements and challenge stereotypes, among other actions. 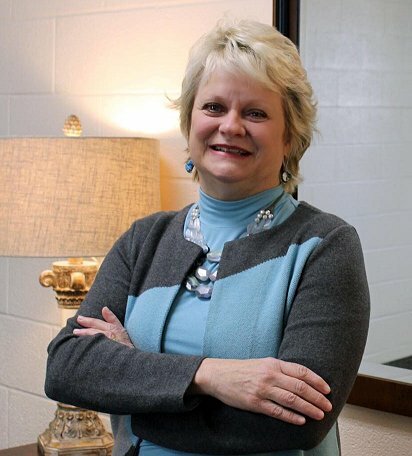 The ATHENA Award, given annually by Girls Inc. and the Greater Owensboro Chamber of Commerce, goes to someone who is a tireless champion for women, devotes time and energy to the community and demonstrates a high degree of excellence at work. “(Fiorella) has earned a notable reputation for innovation and leadership in state and national workforce development initiatives,” Kirk Kirkpatrick, the event emcee, told the crowd. Her work has gained attention in several publications. She has served as a speaker and panelist in state and national forums. In addition, she has served on several national advisory panels. As far as community support, Fiorella has served on the boards of the Green River Area Development District, Career Center of Owensboro and Theatre Workshop of Owensboro. Lyric Payne, 18, a senior at Daviess County High School, earned three scholarships totaling $7,000 at the luncheon. Payne started attending Girls Inc. when she was 6 and very shy. “Yet, as time passed and my tears dried, I began to open up,” Payne told the crowd. As she matured, Girls Inc. remained a stabilizing force in her life. The staff reached out to her during later battles with depression. “It’s as if anytime I strayed from the right path, Girls Inc. somehow led me back to it,” Payne said. After volunteering for the nonprofit, Payne now works at Girls Inc. She plans to earn a degree in film production from the University of Arizona. At Thursday’s luncheon, Sue Napper, the event’s chairwoman, presented the second Legacy Award honoree — Nannie Locke. The Legacy Award goes to trailblazers who championed women’s rights. In the late 1800s and early 1900s, Locke worked tirelessly to improve the lives of Owensboro’s black residents. “Her story is one of courage, faith and tenacity,” Napper said.